I have been working at TI for nearly 8 years now. I have also been living in Kadugodi for nearly 7 years in a self-owned apartment. 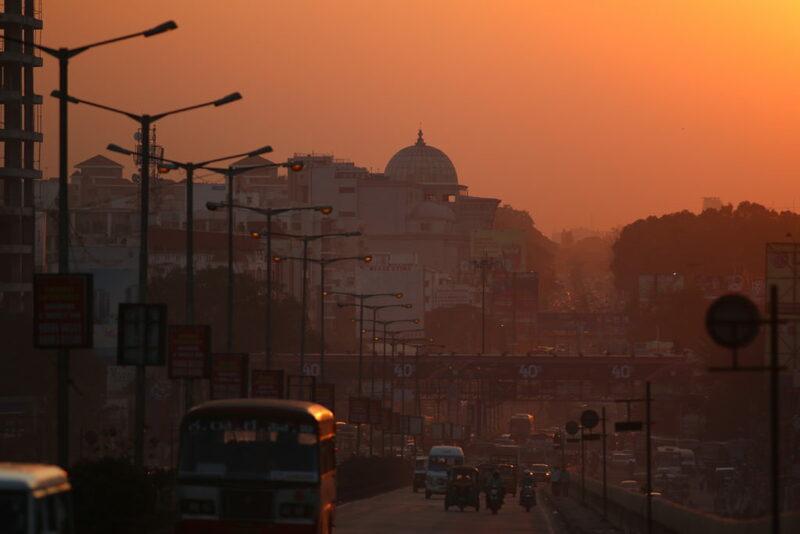 I can already hear readers who are residents of Bangalore going “whoooaaa! Kadugodi to CV Raman Nagar!! How does this guy even do it?”. Thankfully, the truth is not as bad as it appears. I maintain very strict journey times to avoid peak traffic and manage the one way journey in 30-40 mins. My average is about 33 mins. Before I begin the rest of my story, I should thank Lord Vishnu for choosing to rest in Thirupathi. I don’t know if my theory is true, but I think Old Madras Road is maintained so that the travel to Thirupathi remains convenient. The population on this side of the city has burgeoned manifold, numerous junctions have been added, signals have come and gone, but my travel time stubbornly remains between 30-40 mins. There is some crazy disruption every few months, but the almighty gets into action soon to miraculously clear up the mess. 30-40 mins of one way commute is probably in the top 20 percentile levels in Bangalore (higher percentile = lesser travel), but it is still a significant amount of time. For a long time, I was literally at war with myself; I was considering moving back to some place closer. But self-owned homes kind of grow on you; Readers who live self-owned homes can relate with me. The roots just keep going deeper. Reminds me of the great Kannada poet Kuvempu who said “ಮನೆಯನೆಂದೂ ಕಟ್ಟದಿರು …. ಓ ನನ್ನ ಚೇತನ ಆಗು ನೀನು ಅನಿಕೇತನ”. Translated as – “Rest nowhere on the unending road, never build a binding nest …. Never touch the boundary, Remain infinite and boundless! !” in a famous poem. I now know that he meant it both figuratively and literally. Once the realisation dawned upon me that a large part of my life is going to spent on the road for a long time to come, I began to think about the means to use the time spent more efficiently. One could consider hiring a chauffeur, but it is an expensive option that costs upwards of Rs.12k per month and my motion sickness does not help either. I am at ease only when I am in complete control. The brake-gear-clutch-gas drudgery was unavoidable. Back in the days when smart phone technology was not upto the mark, it was quite hard to do justice to 30-40 mins of travel time. I used some of my time on the way to office planning the day’s activities. If there is a particularly hard technical problem that demands a fair bit of imagination, a stalled car in a traffic signal is one of the best place to think about it. 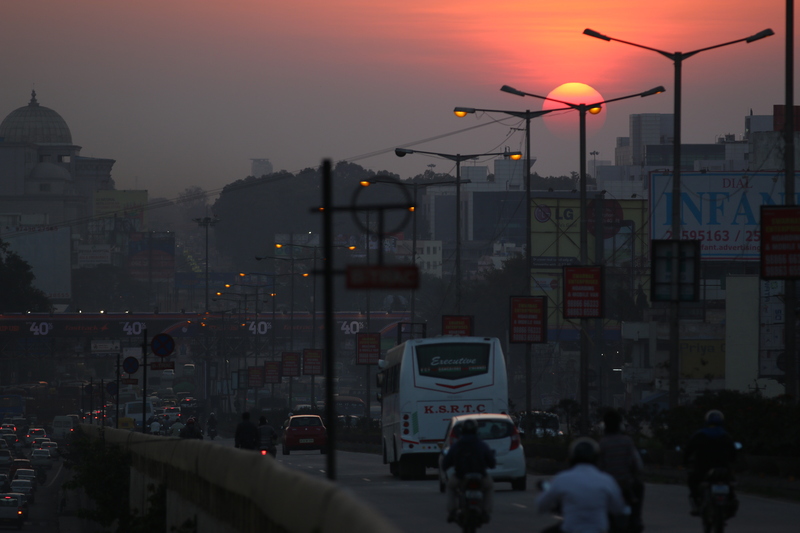 Infact, ~50% of the interesting ideas that I have come up with have been on old madras road. In the evenings on the return journey, I would spend the time recalling the key events, discussions and decisions. But day dreaming is risky at times; there is always this street ninja who is out to surprise you. On an average, I could use ~20% of the travel time thinking about things that mattered. Taking calls is another activity that one can do on the road. But our R&D team is entirely located in one office in Bangalore and there are not too many calls that I need to attend around the travel times. Radio used to be a decent entertainment option, but most of the stuff on Radio these days is reality advertisements and other garbage. With the advent of smart phone, things changed remarkably. Music became a major component of travel. I am terrible singer, but who cares?? No one can hear me outside the car. Singing along classical singers became one of my favourite pass-times. Google Music added an entirely new dimension. I now have my entire collection online. I have playlists for various times-of-the-day, moods, people in my car etc. Most recently, listening to books on Amazon’s Audible has become my favourite activity. I spend ~Rs.1000 every month, but that covers for nearly 50% of my time in the car. I don’t mind the traffic at all these days. Infact, there are times when I am close to one of those critical moments in a book and I wish that that last signal on my journey stays at red for a little while longer. If you ever find yourself wondering what to do next with your high energy toddler, this game could come in handy. All it needs is 3-4 colored crayons and 4′ x 2′ of space. 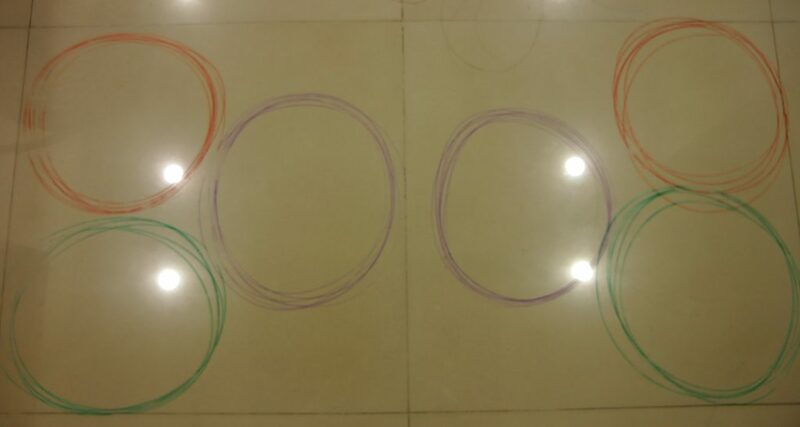 Draw some colored circles on the floor (Squares work too). Be sure to keep it symmetric on at the least one axis to keep it simple. Toddlers can imagine mirroring more easily than rotation. It is easy to add more complications. Adding more circles is one way of doing it. One can add different shapes too. Encourage your toddler to memorize the color-position association so that he/she need not look before taking a jump. The memorization helps to train spatial memory.